Snapshot from the film days. Beginning of Winter in Texas. 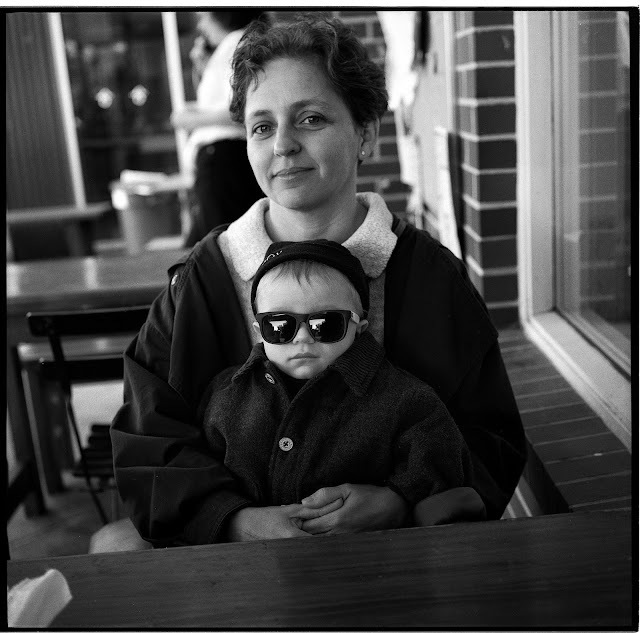 Belinda and the Boy. Camera: Rollei 6008i. Over the years various traditions have been added to the holiday. My least favorite until recently was the "Black Friday/Midnight on Thursday Shopping Hysteria." A prank by retailers who offer a limited number of "deals too good to be true" to lure in hordes of price sensitive shoppers determined to save money on stuff they might be better off without. In the Black Friday tradition we photo enthusiasts have recently been subjected to an added circle of hell; we've added the Photobloggers and Review Site Writers Top Ten Lists to the menu. To boost clicks they'll have cunning lists of the: The top cameras of the year! The top photo accessories of the year!! The top flash gear of the year!!! Lenses that will cause you to die if you do NOT own them!!!! and each site will feature their lists in the form of a daily countdown toward the number one item in each category. All with links to Amazon and B&H. While most sites will choose the most popular photographic items in the hopes that their choices will drive the most click through sales from you, you can bet than Canon, Sony, Nikon and Olympus will be well represented on almost everyone's list. Everyone will, no doubt, toss in an inexpensive medium format camera as well. It's just the season for it. Now, make no mistake, the writers are in no way representing that they have ever touched, seen or handled a lot of the gear in question. They might add a Leica to their list just to ramp up the perception that the writer is among the elite or cognoscenti of photography, but you can be sure there will be several budget DSLR cameras mixed in that have bigly selling potential as well. I plan on participating in my own eccentric way ( I am a photo blogger after all), but I'm going to give the holiday a break and not start into the list making until the first part of December. I'm only going to put stuff on my list that I've actually owned and used. It's going to be a shorter list this year. I might only have three top cameras on it. 1. Plane tickets to someplace I've always wanted to photograph. 2. Extra cash for model fees so I can do that conceptual photo shoot I dreamed up. 3. Better coffee so I can enjoy being more awake while I post process files. (Wanna get me coffee for the holidays? Send me a can of Illy medium roast, pre-ground. I'm not much of a snob but this is my coffee of choice, you can get it on Amazon...hint to #1 son). 4. Some faster memory cards so I can make that video about Winter Masters Swimming at the 400 mb/s setting video setting. 5. More free time to walk around aimlessly and click a currently owned camera at random stuff that catches my eye(s). 6. A season pass to local area art museums for the year so I can see every show without thinking I should just save on admission for the next great lens. 7. A gift of better discipline so I can finally spend the money on framed prints for my show instead of the next great lens. 8. A photo book full of absolutely false (but authoritatively written) reviews that laud pedestrian and affordable gear and trash high speed, state of the art gear, so I have more incentive to stick with gear that I can afford. Such a book would save marriages, budgets and countless hours of internet "research." Chapter one: "The Panasonic 25mm f1.8 lens is the most under appreciated lens in the lens cosmos. With astringent sharpness even wide open it is peerless at every f-stop and defies completely the physics of diffraction...."